Dresden has much to boast about when it comes to tourist attractions, but you don’t need a lot of time to explore it. Although there is a great deal of things to do in Dresden, the city is compact enough to be covered in 4-5 days. 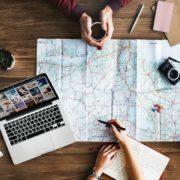 There are many fabulous museums, art galleries, churches, as well as an array of exciting events that can justify a longer trip if you have the time. 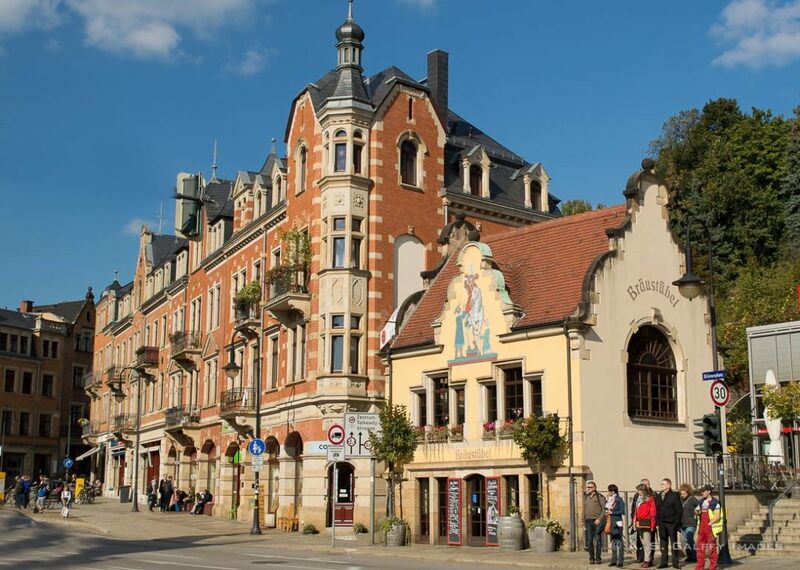 Given the city’s great location, there are also many exciting day trips from Dresden that you can take. Like visiting the Bastei Rocks in the scenic countryside of the Saxon Switzerland. Or the town of Meissen, the birth place of the famous Meissen porcelain. 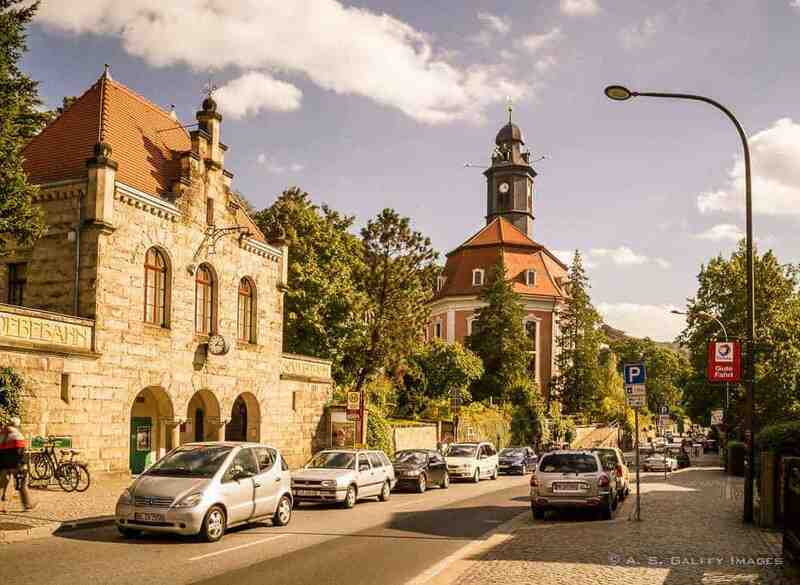 Or the Konigstein Fortress, the market village of Moritzburg, and the Pillnitz Castle. The Baroque Quarter (a.k.a. 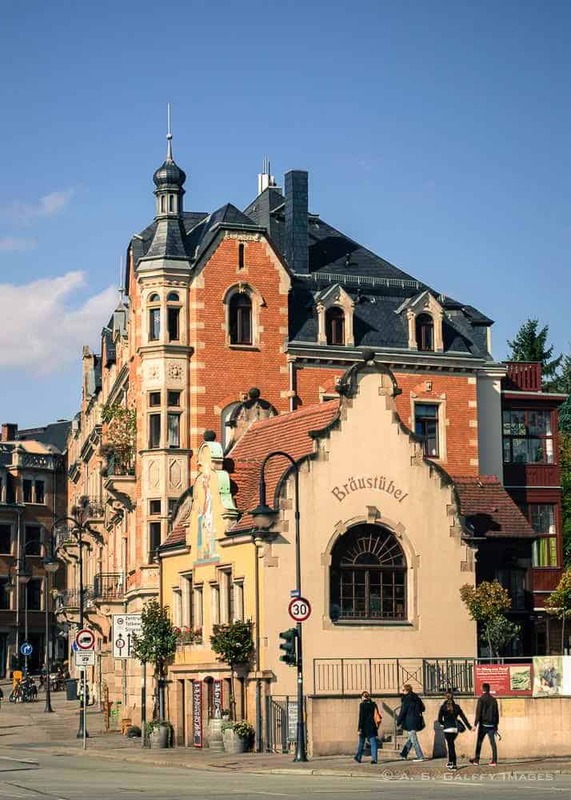 Inner Neustadt) is located between the Neustadt train station, Albertplatz and Glacisstrasse. The most elegant street in Dresden Neustadt is, Königstrasse. Although not severely damaged during the war, this street fell into complete neglected under the GDR-era. In the 1990’s, after the fall of Communism, the buildings have been repaired or rebuilt. An array of boutiques,art dealers, galleries and upscale restaurants have been built. Today, Königstrasse is home to the most sophisticated shops in Dresden. Many of the stores and small restaurants are in passageways leading off Königstrasse are also worth visiting. One of the must-sees in the Baroque Quarter is the Church of the Three Magi (Dreikönigskirche). The baroque church stands between the Haupstrasse and the Königstrasse. The original building dates back to the 18th century, but its 87-meter high tower was added only 100 years later. The clock tower can be seen from very far away and it’s an unmistakable part of Dresden’s cityscape. Although not very ornate, the interior of the church is worth seeing for the beautiful altar piece. The sandstone altar was damaged in the bombing of 1945, but it is now restored. Wandering through the small alleys of the Kunsthoffpasage was my favorite thing to do in Dresden. Tip: To find this place you have to know exactly where it is, since it’s not likely that you’ll stumble upon it. Kunsthofpassage is in Dresden Neustadt (new town), between the Alaun and Görlitzer streets. This neighborhood is also known as the student district, so it’s unlikely that you’ll find in described in the mainstream travel books. This little dairy shop in Neustadt Dresden made quite a name for itself over the years. It wasn’t for the milk products it sells however, but rather for its unusual beauty. I’ve seen pictures of this place before visiting Dresden, so I was very excited to visit it. However, when I found myself in front of it I felt a little disappointed. The dairy shop sells a big range of farm and artisan cheeses, different milk products, wines, chocolate and replica tiles. Upstairs there is a café-restaurant serving food with a strong lactose theme. Due to its popularity, the small milk shop is almost always packed with tourists. 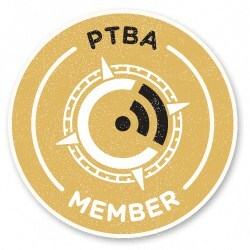 Tip: Photography is verboten (forbidden), but you may be able to take a few shots if you show your press card. The shop is difficult to photograph because it very small and always crowded. But if you wait for the brief moment when a group of visitors is leaving and another one is waiting to get in, you may be able to catch a few shots. But you have to be very fast! Old Town Dresden it’s a true miracle of rebirth who has risen like a Phoenix from its own ashes. Between the Allied bombing that leveled it to the ground during WWII and the 50 years of Soviet occupation, there was not much left of this great city. Those who visited the city during the Cold War, would not recognize it today. 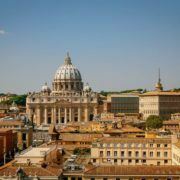 But despite the devastation caused by the Second World War, the city has regained its architectural splendor and charm. There are very few city skylines more striking than that of Dresden. You don’t have to be a music lover to like sumptuous building of Semperoper, but for me this was one of the best things to do in Dresden! Built in 1841 by the German architect Gottfried Semper, the building was completely destroyed by the Allied bombing in 1945. After extensive reconstruction the Opera reopened in 1985 with Carl Maria von Weber‘s “Der Freischütz” – the same piece that was performed before the destruction. The beautiful plaza in front of the Opera (Theater Square) is the place where most of the organized city tours begin. Because opera is not a mainstream form of entertainment, many people regarded it as a pretentious one. However, if you give it a chance, you’ll discover that opera can be enjoyed by classical music lovers and complete newcomers alike. 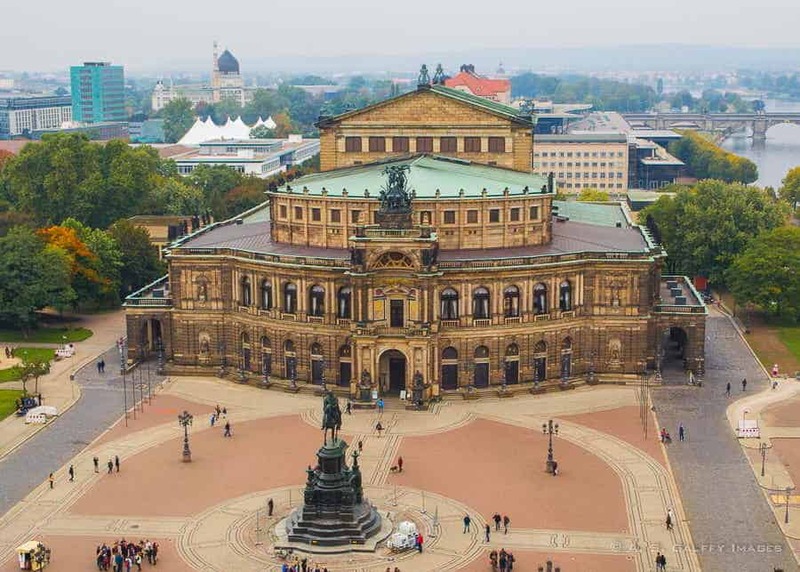 But for those not interested in attending a performance, there is a 45-minute guided tour (both in English and in German) that talks about the history and acoustics of the Semperoper. 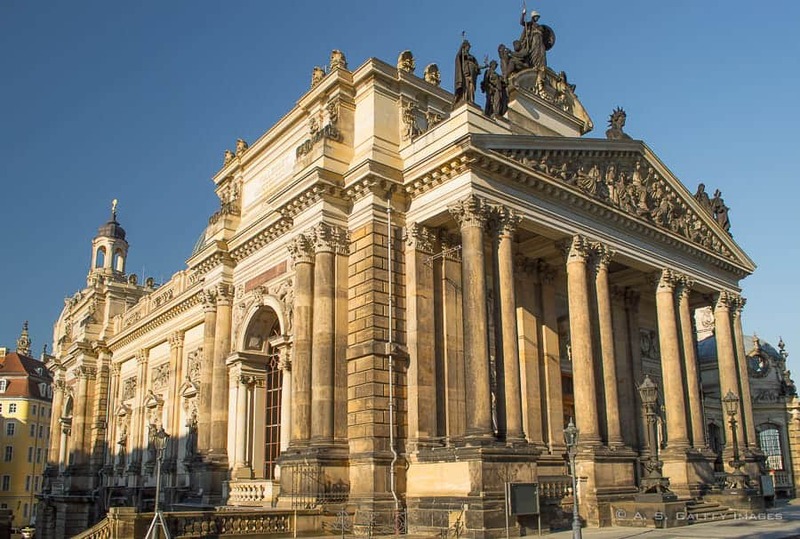 A splendid example of German Baroque architecture, Zwinger Palace is one of the most popular attractions in Dresden. 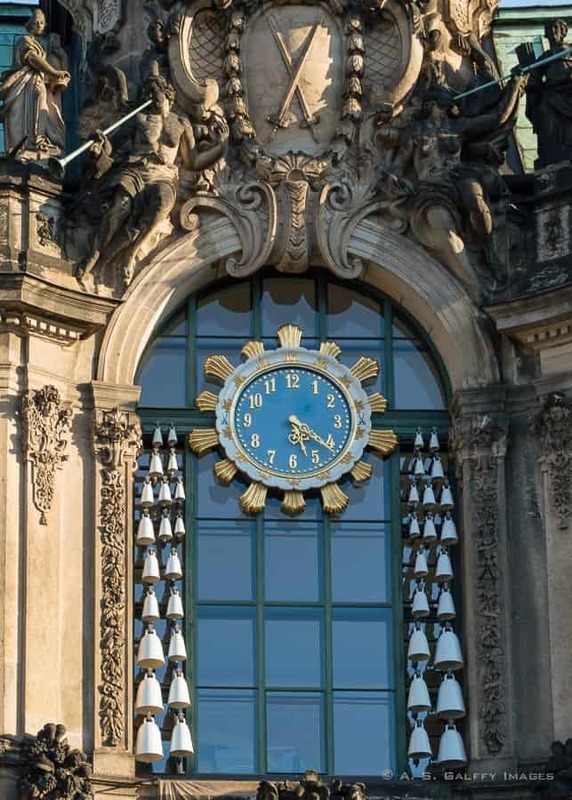 The palace is home to first-class museums, like the impressive Old Masters Picture Gallery, the Zoological Museum and the Mathematisch Physikalischer Salon and a fascinating porcelain collection. But as much I enjoyed the inside of the palace, I liked the outside even more. I started my visit in the inner courtyard. As I was strolling through the beautiful water fountains, taking pictures and trying to make the most of the morning light, 40 Meissen porcelain bells began a sweet three-minute melody. I put my camera away and tryed to see where the music was coming from. It was the Glockenspiel Pavillion (Carillon Pavilion), the most impressive of the six pavilions of the complex. Like much else in Dresden, Zwinger was built in 1709 by Augustus the Strong, prince Elector of Saxony. I continued my visit up to the terraces garnished with numerous statues of nymphs and tritons. What a beautiful sight! I stayed there trying to imagine this palace in its times of glory. Could it have been even better? Frauenkirche is a symbol of the city and one of the most beloved attraction of Dresden. The church dates back to 1726, but the consecration was 7 years later. 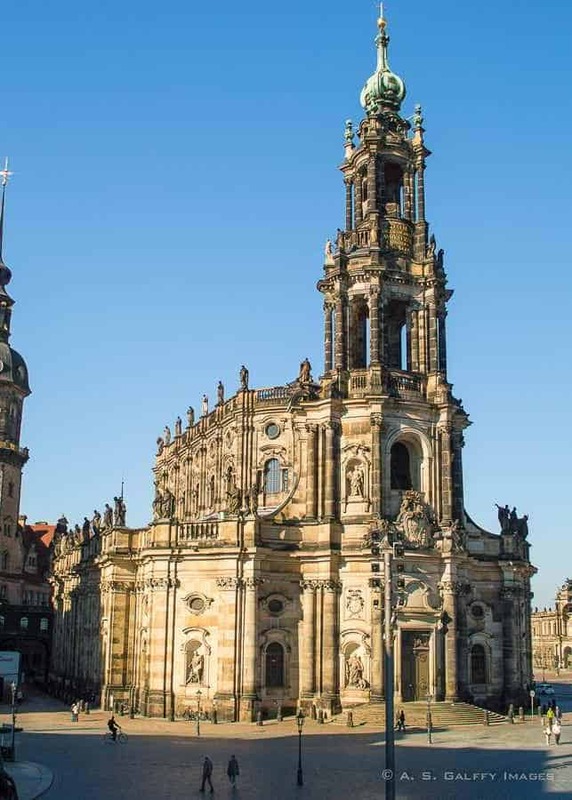 George Bähr, Dresden’s master carpenter, designed an impressive 95m high baroque church with a stone dome which became known as the ‘stone bell’. Although not directly hit by the bombs, Frauenkirche collapsed during the bombing of 1945 due to the heat around it . The church was very dear to the residents of Dresden who wanted to begin the reconstruction right after the war. 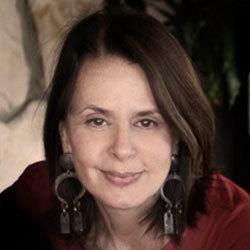 However, for political reasons, the project was postponed for a long time. As a result, Frauenkirche remained a pile of rubble for almost 50 years. The church reconstruction started after the reunification of Germany, but it ended only in 2005. Most of the funds for the reconstruction came from private donations from all over the world. Around 3,700 stones have been salvaged from the original church and reused in the rebuilding. 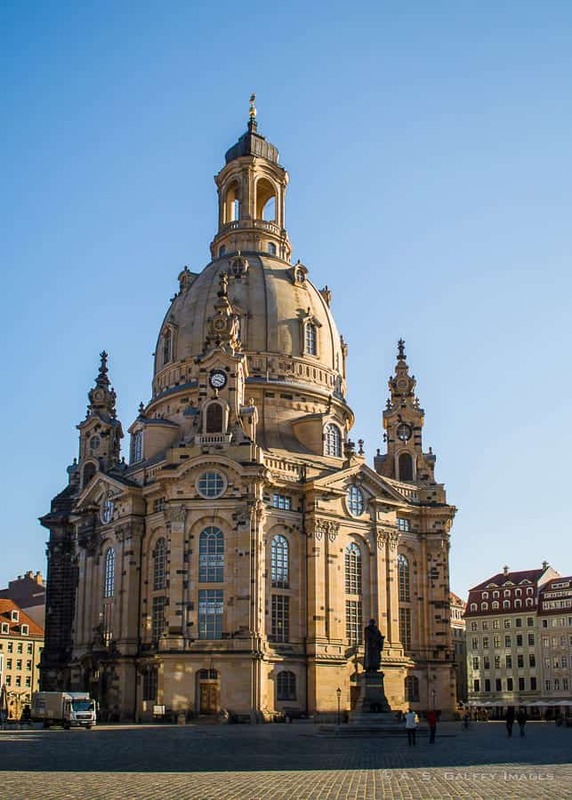 One of the most popular things to do in Dresden is climbing atop the dome of Frauenkirche. From the viewing platform at the dome you can enjoy spectacular views of Dresden and the Elbe river. 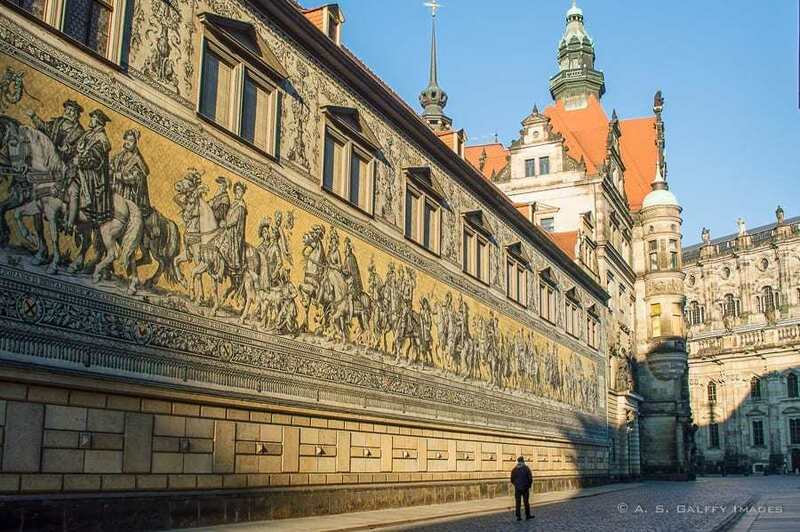 Located on the outside of the Royal Palace complex, Fürstenzug (the Procession of Princes) is the largest porcelain mural in the world. The mosaic depicts a parade of Saxonian princes, dukes and kings of the Wettin Dynasty. Each ruler’s name is inscribed below his image. We stumbled upon this grandiose landmark on our first night in Dresden. The mural appeared totally unexpected, on the narrow Auguststrasse. It was absolutely breathtaking. The 330 feet long mural was originally painted in 1876 by artist Wilhelm Walther to celebrate the 800 year anniversary of the Wettin Dynasty. But by the end of the 19th century the new stucco started deteriorating. 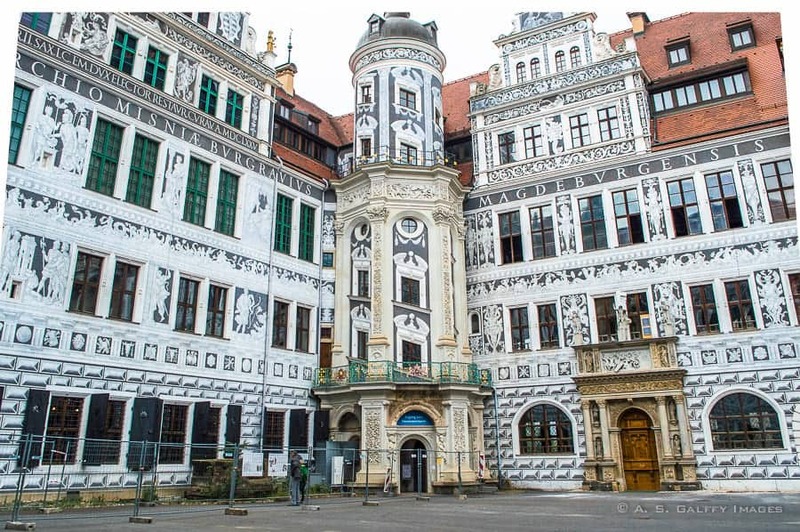 In order to make it weather-proof, the original decoration was replaced with 25,000 ceramic tiles from the famous porcelain manufacturer in Meissen. The mosaic tiles miraculously survived the devastating bombing in 1945. Dresden Cathedral is also known as the Cathedral of Holy Trinity. This is the city’s most outstanding landmark and one of the must see places in Dresden. Katolische Hofkirche measures 4800 square meters, making it the largest church in Saxony. Commissioned by Frederick Augustus II, Elector of Saxony, the cathedral became the church of the royal court. The Italian Baroque architect Gaetano Chiaveri designed the building plans around 1738. Named after King Albert of Saxony, the Albertinum is a modern art museum located on the famous Brühl Terrace. The museum houses the New Masters Gallery which contains more than 2,500 paintings from the 19th and 20th century, and also a vast Sculpture Collection. The Renaissance Revival building of the museum was erected on the foundations of a former armory. At the end of the 20th century, Albertinum underwent massive renovations in 2002, following some severe flood damages. Brühl’s Terrace is a beautiful promenade that runs for about 500 meters along the Elbe, atop the Dresden Fortress. Built as a ring of walls surrounded by a water trench, the fortress is thought to be the oldest Renaissance structures in the city. Nicknamed “The Balcony of Europe” the terrace offers a gorgeous view over the Elbe river and the monumental buildings of the Neustadt district, (the new part of Dresden). Brühl Terrace starts in the Schlossplatz (Castle Square) with a monumental staircase and continues all the way to the Albertinum Museum. The staircase is flanked by four bronze sculptures, each symbolizing one season. The promenade is one of the most popular places in Dresden enjoyed year-round by locals and tourists alike. During the Second World War the collection was removed from the Green Vault and hidden in the Königstein Fortress, thus escaping the Allied bombing which devastated the city. The Royal Palace also burned down to the ground during the war. The extensive reconstruction process began in 1985 and lasted for almost 20 years. The new Green Vault opened its doors only in 2004 followed by the historic Green Vault two years later. There is a wonderful view of the Old Town from atop the Hausmann Tower, so don’t miss it if you visit the royal palace. A visit to the Green Valut requires some planning as only 100 visitors per hour can get inside. Since tickets are valid for a specific time slots only, you have to be there on time. If you are making any plans for a road trip to Germany, make it a point to add Dresden to your itinerary. This largely overseen city has a lot going for it: beautifully restored churches, old palaces, world class museum, any many more. 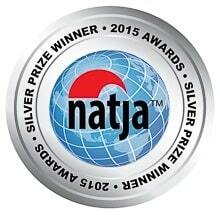 And if you go, remember to visit Neustadt Dresden and discover some of Dresden’s best kept secrets. I usually don't have much time when I go on vacations so good to know Dresden could be done in 4-5 days. 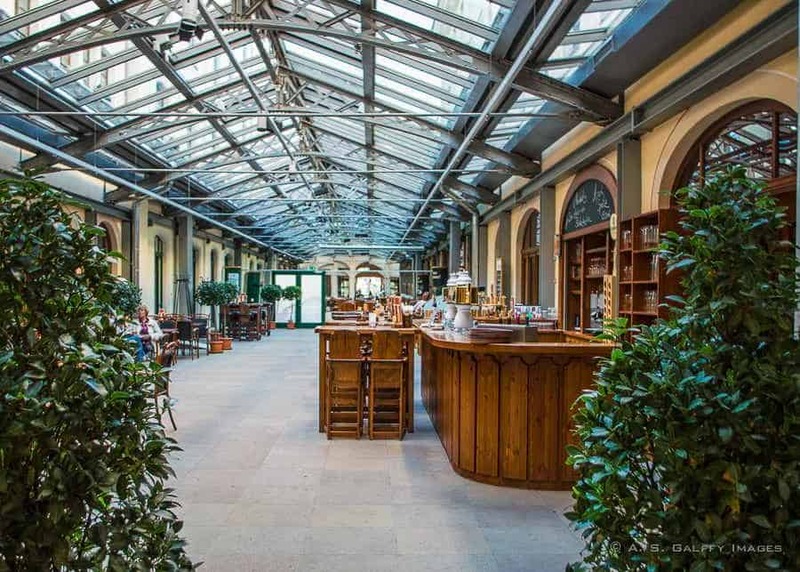 Pfunds Molkerei is totally up my alley and you’re so right that the interior is a feast for the eyes. Wow! Kunsthofpassage looks amazing too. All of your suggestions are so lovely and they make me want to visit Germany now! 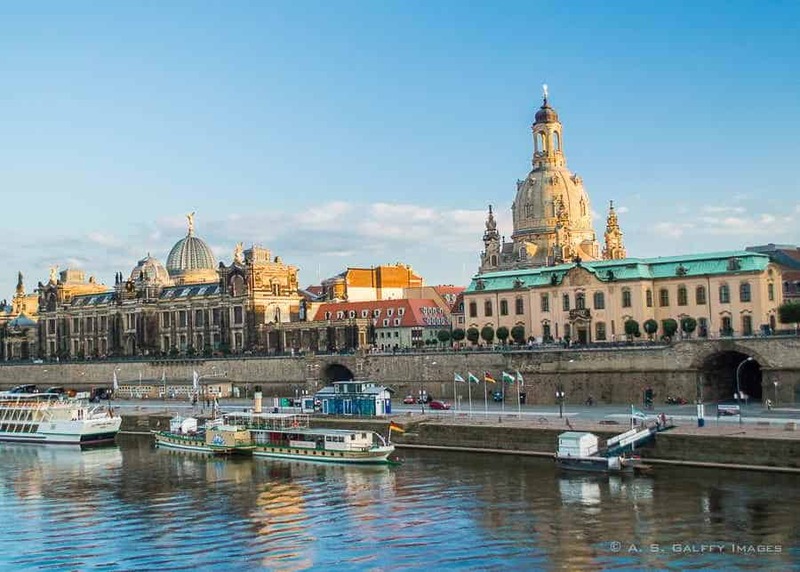 Dresden is surely an interesting historic town, not very far from Berlin. I would love to explore the Old Town - I found the Zwinger Palace very interesting. I can spend a lot of time in the Baroque district. The Procession of Princes Mosaic and the Cathedral also beautiful. Such a small town and yet so many significant and artistic places to see there. I would love to spend a day or two there when in East Germany. I missed the opportunity to visit Dresden while in the area earlier this year and having read your post I'm definitely regretting that I didn't make the extra effort to fit it in. 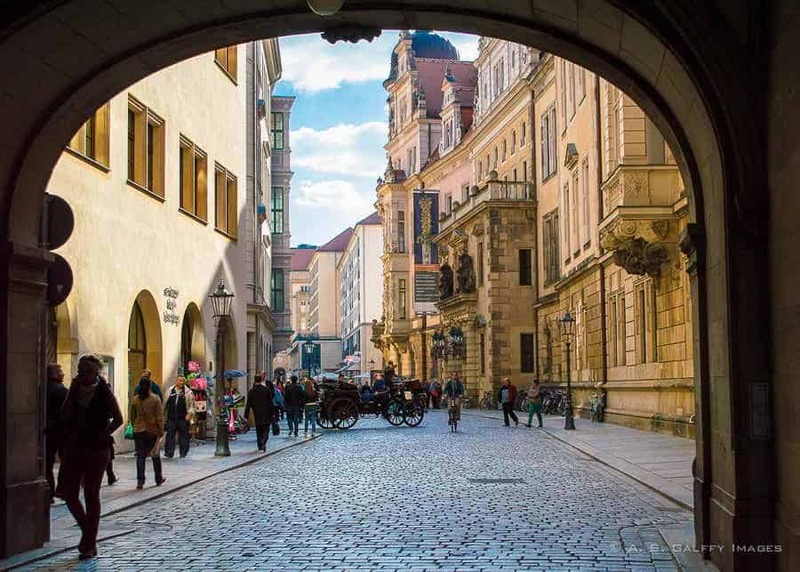 Dresden looks so amazing and the experiences it offers - especially the singing pipes - seem to be right up my alley in terms of what I enjoy taking in when I travel. 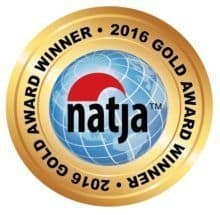 Thank you sooo much for sharing! Next time I'm in this neck of the woods Dresden will be top of my list! 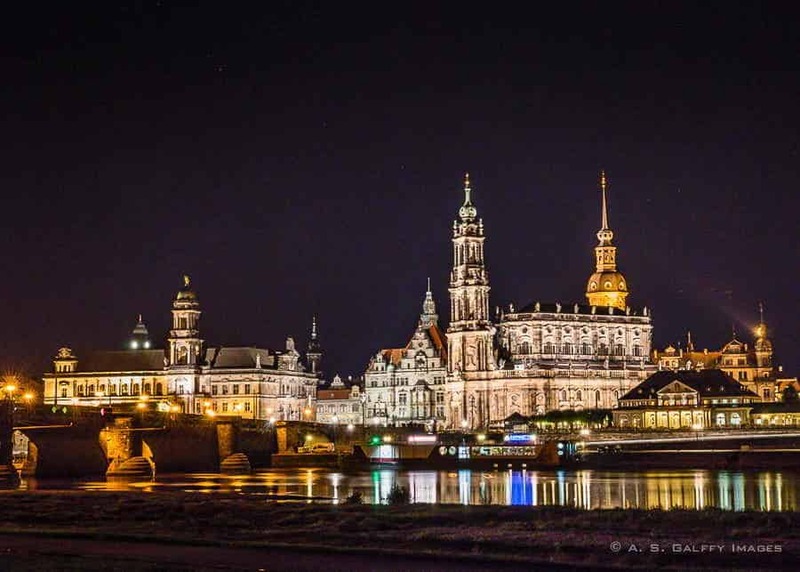 Dresden is charming and your pictures show the real beauty of the place. I so regret not being able to make it there on my recent trip to Germany. I would have loved a stroll through the Baroque quarter. And those singing pipes - I had no idea about them. They are such a wonderful piece of art. Dresden is very much on my list for the next time. You have got me planning again for Germany! 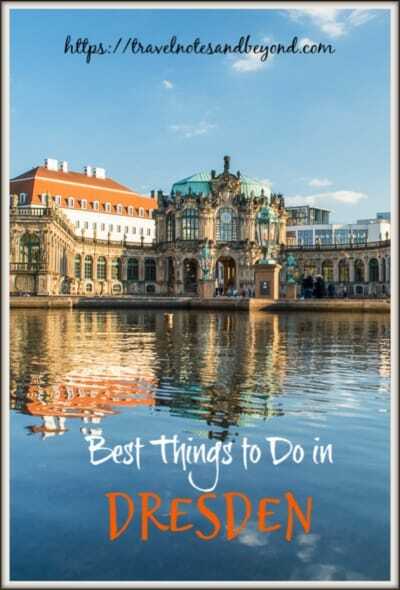 I've been putting together an itinerary for visiting Germany and I almost wasn't going to put Dresden on it, just because there are so many places I want to see. 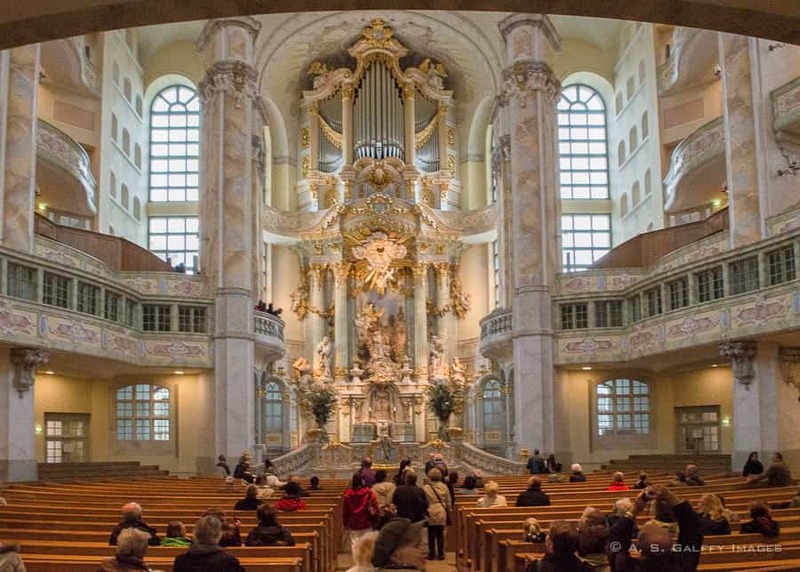 But after seeing your photo of the interior of the Frauenkirche, I've reconsidered! Absolutely breathtaking. Thank you for putting together such a comprehensive guide to the city. Wow, the architecture is phenomenal! 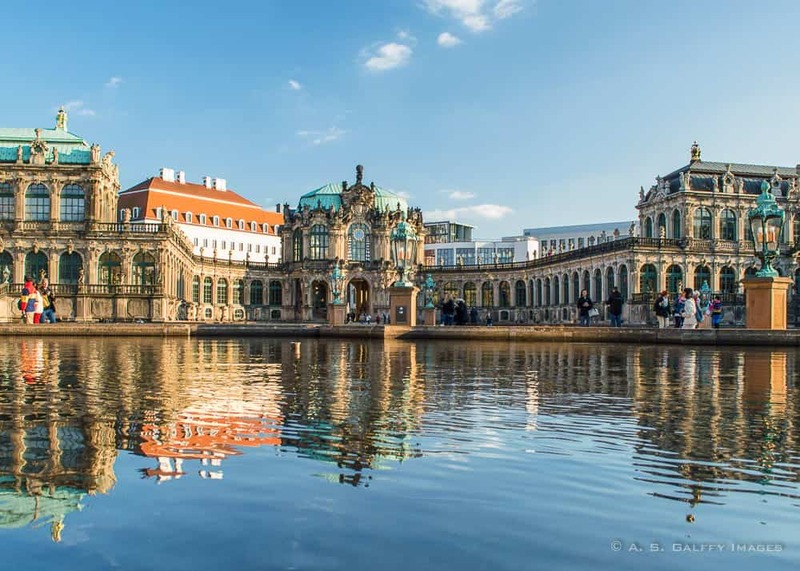 Especially Old Town and Zwinger Palace, they seem straight out of a fairytale. I will hopefully be visiting Dresden next time I am in Germany! Dresden seems like such a beautiful place. The beautiful architecture gives it an old world charm. I love visiting heritage museums and churches. 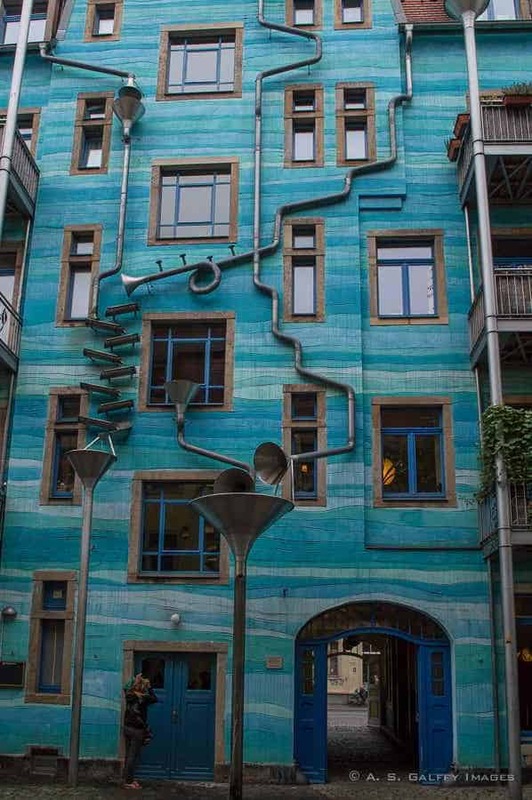 The Singing Drain Pipes of Kunsthofpassage seem really interesting. I agree - despite the devastation caused by the Second World War, the city has regained its architectural splendor and charm, it's so obvious by the stunning photos you've taken at night. Also, I'd love it even more here because they have a gorgeous Cathedral, coming from a Catholic country, Ima big fan of churches and cathedrals. I've heard about Dresden but haven't visited yet. This year I will move to Germany particularly in Munchen and I'm looking forward to seeing this beautiful country! Dresden is high on my list of places to visit in Europe but I'd never heard of that cheese shop. What an incredible interior! So glad you had a press pass to get pictures. It wasn't easy to take the shots though. Too many people around. WOW! That looks like a beautiful historic town to visit. I absolutely love old buildings with lots of character. I would be in awe of them! That dairy shop tho, wow! Have been never been to Europe, but would love to visit one day! Oh wow, Dresden looks beautiful, that restuarant looks so nice! 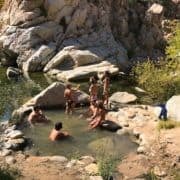 I'm currently doing a PhD in the UK and am always looking for places in Europe that are historical small towns that could be seen in weekend. Is Dresden somewhere that would be good for a weekend trip, or does it require a longer visit? We stayed in Dresden for a week and still didn't cover all sites. Old Town Dresden could probably be covered in a week-end though. Königstrasse looks like a great urban renewal project. It's interesting to see how Dresden is changing after the fall of the GDR. 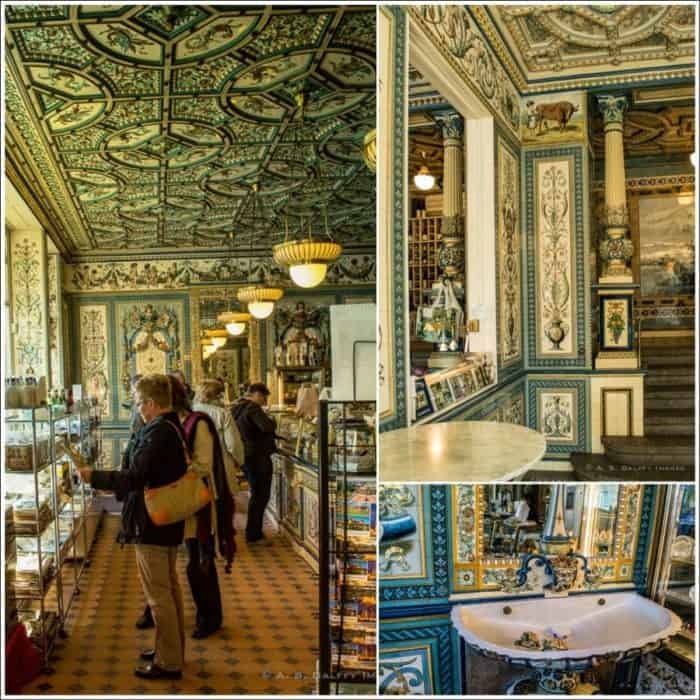 There are plenty of places to see (and eat) on a visit to Neustadt, Dresden. I'm really enjoying your Dresden posts Anda. It honestly wasn't near the top of my Germany list before, but each post has it rising further up. Always happy to explore for some elegant baroque architecture. We wanted to visit Dresden as a day trip from Prague but decided to dedicate a decent amount of time at a later time. I really want to see as much as possible of it. The dairy shop is way too cute. I am intrigued about your press card. What do you use / have? I have a couple of them, Ruth. 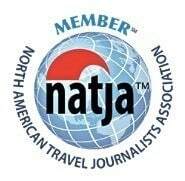 One is from the North American Travel Journalists Association and the other is from the International Travel Writers Association. They second works better in Europe. What an adorable dairy shop! Those painted tiles are absolutely charming, and the ceiling is stupendous as well, I must say. Did you go upstairs to sample their menu? I would be all over anything related to cheese! Was the cafe full as well? The café wasn't full, but it wasn't as nice as the shop itself. 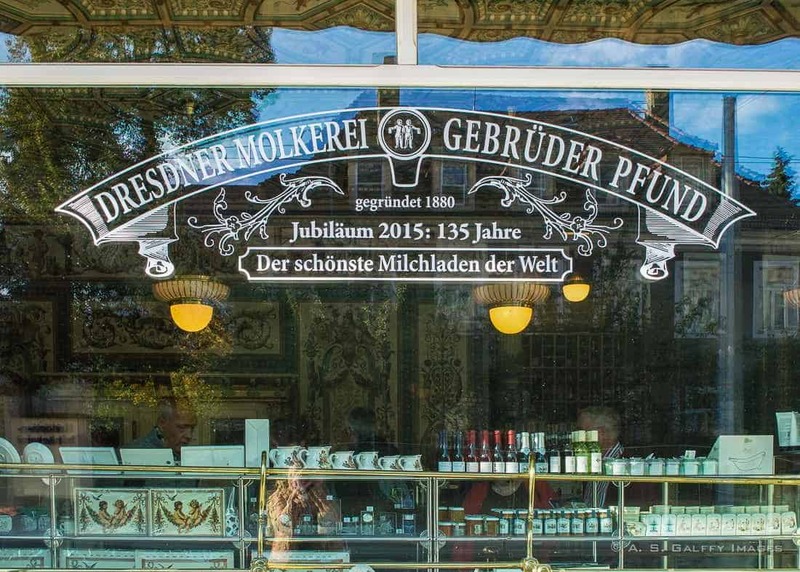 Your photo of the outside of Pfunds Molkerei definitely belies its charm. Your interior shots are great (and show a lot of patience). I did not know a lot about Dresden so the information on its history is interesting. 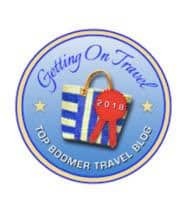 Dresden is on my list, we are heading that way this summer so fingers crossed! Lovely photos. I've never been to Dresden, but the buildings look so colourful and characterful. 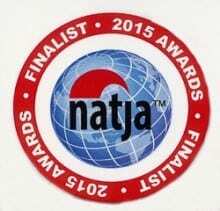 Duly noted and putting it on the list! Wow that store is really something! I have not been to Dresden and would love to do a road trip in Germany so will keep that in mind. I've always wanted to visit Dresden, ever since I read a book about it in college. I can't believe they have those beautiful tiles in a dairy! Ooh you did find some nice gems in Dresden! Pfunds Moklerei looks amazing and I'd love to see it myself! We plan to return to Dresden one day as our first visit was an ultimate trip fail! Dresden is quite close from you, Lolo. You can it visit anytime. One of the first few books I read before my study abroad semester was the I Will Bear Witness series by Victor Klemper. His stories of Dresden put it on my list, and though I haven't made it there yet, it is definitely on my list. I'm curious to see how the old and the new co-exist as you mentioned in your post and based on what I saw in Berlin. I've never heard of that book, but it must have been quite a beautiful description of Dresden in it if it helped you fall in love with this city. I've never been to Dresden but it looks like there's a lot to see, particularly in Neustadt. The diary shop is very impressive inside, love those tiles! I know it is not year-round, but right now (and every Dec) Dresden is the perfect place to go for the Christmas Market! One of the largest and most famous in Europe. Might as well make a whole weekend out of it and do all these suggestions on the other days. Sounds like the perfect getaway to me! I hope your feet felt better the next day so you could keep walking around Dresden. What a gorgeous city! The first photo looks like a movie set-the scene is so clean and perfect! And that really must be the most beautiful dairy shop in the world :D I would love to climb up the Neo-Baroque tower. Getting to the highest point in a city is one of my favorite things to do! Thanks, Jen. Pfund's Diary is quite unique and beautiful and so is Dresden, which in my opinion is very underrated. I'e been curious about Dresden, particularly because it's said to have a fantastic Christmas Market that is not as well-visited as some of the others in this part of Europe. The Baroque District looks lovely for a stroll (with healthy feet, though :) ) At first, when I read the Dairy Shop is in the Guinness Book for the most beautiful Dairy Shop in the world, I thought really?!? Dairy Shops are given world records for beauty?! I was quickly silenced with your photos. OMG, that is amazing. You would never know it from the outside, either. Thanks for sharing! Well, thank you Jackie. I'm really glad you liked my photos of the Pfund's Dairy Shop. It's a very unusual Diary indeed. It looks like it was worth the pain of having to walk around! How come you wore tight shoes though? They didn't seem too tight when I started walking, but I probably walk for too long. I don't particularly like German food, except for the schnitzel. They eat a lot of pork which I don't eat, but if you like it they have a lot of tasty dishes.